I just attended the 2013 Association for Tropical Biology and Conservation (Asia Pacific chapter) meeting in Banda Aceh, which I enjoyed greatly. The meeting was more affecting than most, because this was also the first time I had been back to Aceh since 2005, when Kinari and I volunteered for a few weeks just after the tsunami. Overall, the city seems prosperous and busy, with little to indicate the extent of the devastation. The roads are new, the 3G is fast and the Acehnese food is excellent! For many visitors, the tsunami is history, commemorated by the (reportedly) moving and beautiful Tsunami Museum and mass grave. But of course, just ask anyone and the stories are there. I had a day after the meeting before flying back to Jakarta, and decided to rent a car and drive down to Lamno, where Kinari and I had been stationed. The coast road is now excellent, and Lamno is only a leisurely two-hour drive away. As the trip began, I found out my driver’s story: he had been caught up in the waves with his very pregnant wife. They had survived only by finding and holding on to a water-cooler plastic ‘gallon,’ and were swept far inland. His wife gave birth just four days later, and he was full of praise at God’s mercy for sparing her and his child. I asked how people were doing in general. He replied that now that they understood that a tsunami is a freak, natural phenomenon, they were all doing much better. The implication is that for months or years they had believed that they had brought the wrath of God down upon them for being so sinful. As we pulled around the last high, rocky headland, I looked down at the green flat-lands of the Lamno area. Apart from an extra-extra-wide beach, and a few tidy, gridded neighborhoods of new blue-roofed houses there was little to indicate that there had been a tsunami here that had devastated kilometers of fertile land. The town of Lamno itself (just beyond the tsunami’s reach) seemed almost unchanged, and I even managed to track down the wonderful midwife, ’Bu Ita, who had been one of the main healthcare coordinators in 2005. She had remarried, had two new kids, and was now in charge of the Indra Jaya health center. The military presence that had been so obvious in 2005 was now gone, and Lamno had returned to being a sleepy, seaside town. But that was part of the problem: with the vast sums of aid money no longer flowing, trying to make a living was the number one concern for many I spoke to. Over lunch I met a young, unmarried man called Adi; I imagine his story is common. He had lost his father in the tsunami, but his mother survived. The family business of freshwater fish ponds had been destroyed. In 2008, Adi had started an undergraduate degree program in Biology, in Banda Aceh, with a scholarship probably from post-tsunami aid funds. The funds dried up after two years, and he could not manage to work (to pay the $300/semester fees) and study at the same time, and dropped out; his sadness over this was still raw. He moved back to Lamno to take care of his mother, and kept trying to start some kind of small business, but kept on drawing a blank in trying to raise the ‘modal’ (start-up funds). His brother had moved to Banda Aceh, and was now struggling to provide for his own family, and could offer little for their mother, or investment funds for Adi. We were chatting during Friday prayers; Adi explained that he could not attend because he was wearing a T-shirt which would rise up and expose his back, a religious faux-pas. This small detail reinforced his clearly difficult circumstances. All-in-all though, it was good to return and see that for much of the time, and perhaps for most of the people, daily life was back to ‘normal.’ In fact, I felt some discomfort explaining who I was and why I was visiting, since this obviously forced the other person to reach back to a time they would probably hope to let fade in memory. 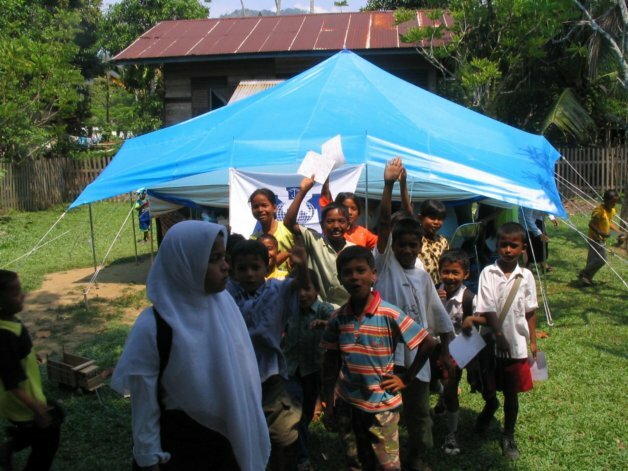 I was stimulated to write the above post by finding the text of an old website that I used to document our 2005 Aceh trip for donors and supporters. Since the site is no longer active, I thought I would post the text again here, as a historical record. Kinari heard about the offer from IMC. Kinari contacted by a colleague (Roger Barrow) from CCRMC who is already out there. 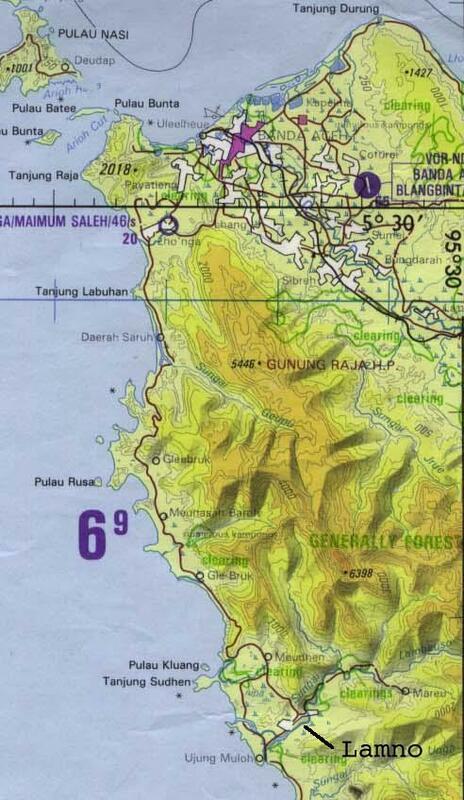 It looks like Kinari may be stationed in Lamno, a refuge camp with 10,000 people, about 25 miles south of Banda Aceh (image source: TPC navigation map). 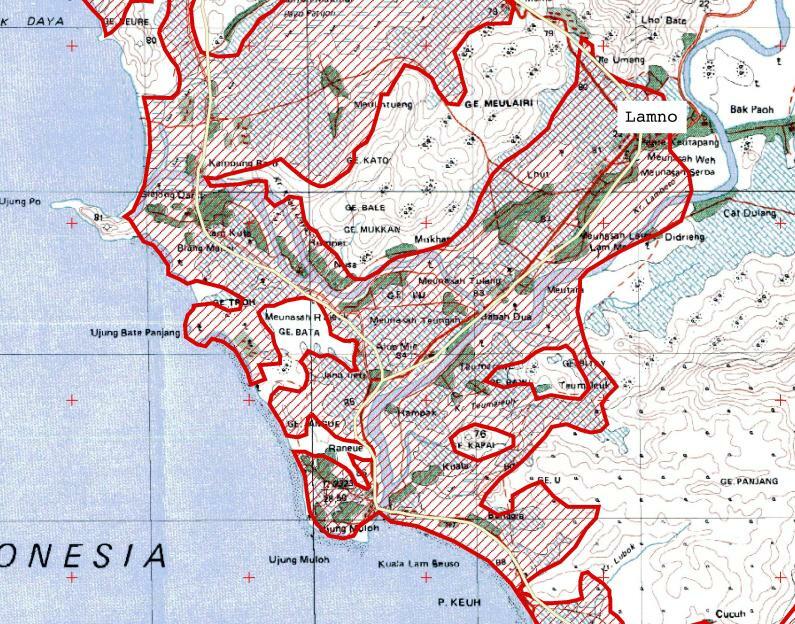 The town is inland a bit and parts of it were not destroyed (hashed areas in red - source: DLR - Center for Satellite Based Crisis Information). Heard from Kinari in Jakarta. 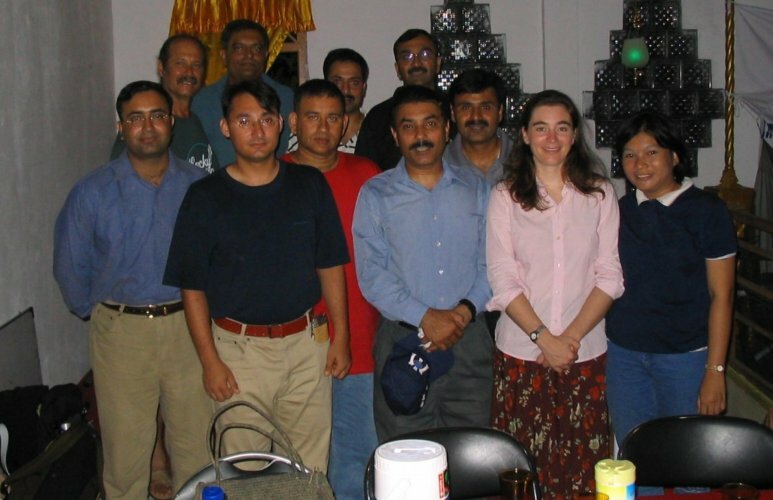 Team of ten doctors. Only Kinari and one other speak Indonesian. They will stay in Jakarta for a day and then travel to Banda Aceh. Kinari called by Sat-phone from Banda Aceh. All well. Place is crawling with Westerners, many of whom it seems have never left the US, but also many crazy-eyed, war-following career aid workers. Helicopters are constantly landing and taking off, and the huge amount of of aid money pouring into the town is very visible. IMC seems very organized, and has rented a big house for the team. And then you leave the ‘busy-zone’ ... and half the town is simply ‘missing.’ In Jakarta, her first taxi-driver was from Aceh and had lost his whole family; he sobbed all the way from the airport to the hotel. Kinari said as she was hanging up that the familiar, wailing ‘call-to-prayer’ had started up, but that it sounded like it was being accompanied by a thousand grief-stricken voices. She hopes to leave Banda Aceh ASAP for Lamno. Kinari is now in Lamno, a town of ca. 15,000 residents and 5,000 Internally Displaced Persons, nestled in green hills. Most of the town escaped the wave (see below). 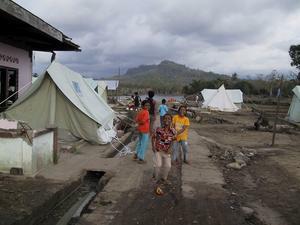 Six aid NGOs are there and working together well. It was great to get out of Banda Aceh, where there is an overload of Westerners and a sense of chaos. Local people are receiving the foreigners well, but with a sense of ‘gratitude and dread’ that all the bad things they’ve heard about will come to Aceh now. It seems like I could be much needed, as an organizer and as a translator. There is still not enough simple asking of the people what they need, due to language barriers. However, one NGO has started a work program, paying people to salvage in the devastation zone for wood and building materials. Kinari is in good spirits but more affected than the other doctors by hearing and understanding the tragic stories that everyone has to tell. E.g., a man who had been trying for 12 years to have a kid with his wife, but who had lost both her and their pride-and-joy, a 10 month old boy. Everyone has ‘run out of tears’ and most have empty expressions. The psychological work needed here is immense, but the hardest for the NGOs to help with. IMC has agreed to take me now, so I’ll be finding a flight in about a week or so. Kinari is working with doctors from the Pakistani army - she says they’re absolutely wonderful! They have a reasonably well-stocked field hospital in Lamno. She helped organize a meeting last night with community leaders (including the local camat whose village was destroyed but who survived). Hopefully the people’s needs will be laid out more clearly here. The camat (district head) has organized a careful counting of the orphans in the Lamno area. IMC has rented the nicest house in the village, so Kinari’s experiencing no serious privations, although the stores (which are all open) have run out of some basics like sambal (chili sauce). In the home front, you have all raised nearly $1,500! Kinari has been working out carefully how to give it out. I plan to leave next Saturday, so please make sure I at least know of your donations by then. Thanks! (PS - if you want, send a photo of yourself - I’ll make a collage of pics that we can give out with the money - it will make the donation more personal, not just ‘cash ex machina’). Kinari called this evening. She said all is going well. There’s an amazing ‘can-do’ atmosphere, almost manic. Ask for a water-purification plant and there it is tomorrow - a million dollars worth. A new clinic - no problem. It seems like the best of the aid world is on show. But the need is unbelievable - there are 12 camps of IDPs up and down the coast, with thousands of people in each one. The psychological damage is amazing. Her ‘warm-and-fuzzy’ story of the day was a kid who’s mother brought her to the clinic. She hadn’t slept since the tsunami, and was so petrified she would not leave her mother’s side. Kinari checked her out and told her mother that she was physically fine, but had ‘sakit hati’ (heartache). But then Kinari gave her a fuzzy toy (a dog as it happened, which may not have been so appropriate! ), and put her on her lap, and the kid was transformed. Smiling and chatting, she would not get down. Kinari then noticed 20 other kids at the windows; the translator told her they wanted to sit in her lap too. The orphans (ca. 500 in Lamno) are one of the biggest problems - the village leaders say they are ‘slipping through the cracks.’ They don’t think there are enough local families to adopt them, and they want to send them to Islamic boarding schools. It seems a new orphanage might be built in Lamno. At the meeting with the village leaders, when asked what the biggest need was, almost everyone said, “schoolbooks,” not food or healthcare. They are very devoted to their kids’ education. I will try to bring a box in when I come from Jakarta, both blank writing blocks and the texts they use (Kinari is looking into what they need). Kinari has been most impressed with a small NGO called Millennium (it didn’t google - I think it is an Indonesian one), one of whose staff has hand-drawn a coloring book about the Tsunami, complete with broken houses, dead parents, crying children, and helping hands from around the world, the message for kids being that they are not alone if they feel sad and confused. But it ends with a smiling kid and the assurance that it is OK to play, and be a happy kid too. Again, the psychological work is going to be the biggest task, and the hardest. The author had no money for photocopying, or for crayons, so IMC was pleased to help out with that! 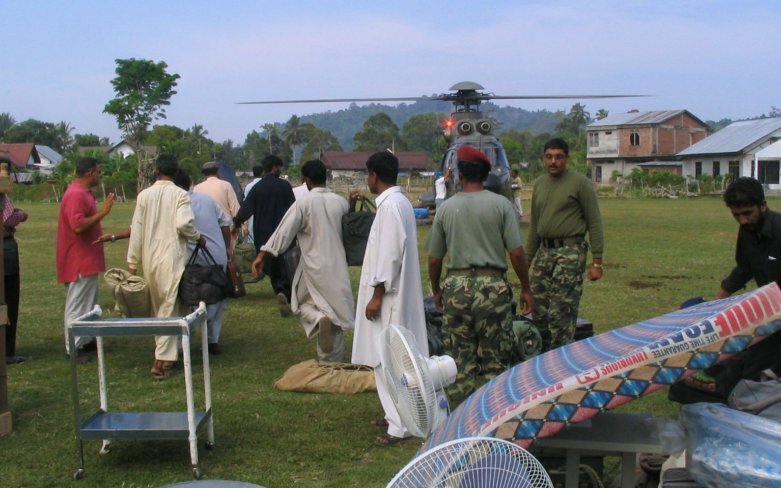 The IMC staff are now preparing to take over the running of the Lamno hospital from the Pakistani army. Talked with Kinari this evening and with Roger Barrow who has just come back from Lamno. Found out that Lamno did have a popn. of 24,000. 8,000 were swept away, and 1,000 more died in the first 24 hrs. The 15,000 were then quickly augmented by 5,000 refugees. There was actually a small cement hospital in Lamno, that had no doctors, but which has be upgraded by the Pakistanis to quite a workable level, with an OR, and hopefully with an X-ray soon. Roger said Lamno was a wonderful place, despite the tragedy, and hopes to go back soon. He said Kinari has been a hit out there. She decided right at the start to wear a ‘jilbab,’ the Muslim headscarf, which proved to be a very good decision. This, combined with her Indonesian and being a woman, has made her someone the women can really communicate with, and they seek her out constantly. When she called, she said she had just attended a funeral, which proved to be a very powerful experience. The orphans are the biggest worry. A very good child psychiatrist visited for a few days, and Kinari learned a lot about talking to kids about their trauma. She recounted the story of an orphan who was swept into the top of a tree, saw her mother washed away, and spent two days in the tree until someone found her. Kinari has become the de facto OB-GYN doctor, which has been stressful. She had a patient who needed surgery who she had to send to Banda Aceh. She was a bit disappointed in the ‘Mercy Ship,’ run by the US Navy, which is spending 3 weeks in local waters. There are 50 docs on board, with US-quality ORs, etc., but the ship can only be reached by helicopter - it will not allow people to approach in small boats (post USS Cole). They gave her four numbers to call to arrange a pick-up or get a consultation, but one number was wrong, and the others had answering machines. So much for emergency service! Hopefully just a momentary SNAFU. The biggest material need is clothes - thousands of people only have the clothes they survived in, and these are probably wearing thin by now! We may buy a lot of clothes with your donations. Which have reached $2,000. Thank you all so much. I am planning to get a trusted local to open a bank account in Banda Aceh so that we can continue passing on any money we raise after we leave Aceh. This may be my last post from the US. I leave on Saturday. I’ll try to post from Jakarta, and there are rumors that IBM set up a WiFi network in Banda Aceh, but the line may just go dead on this end. More posts when I get back. Just tallying up the donations we’ve received: nearly $3,000. Thank you all so much for your generosity and your trust. My Dad: Campbell has left for Aceh via SFO/LA/KL/JAK, rather him than me (his Dad). 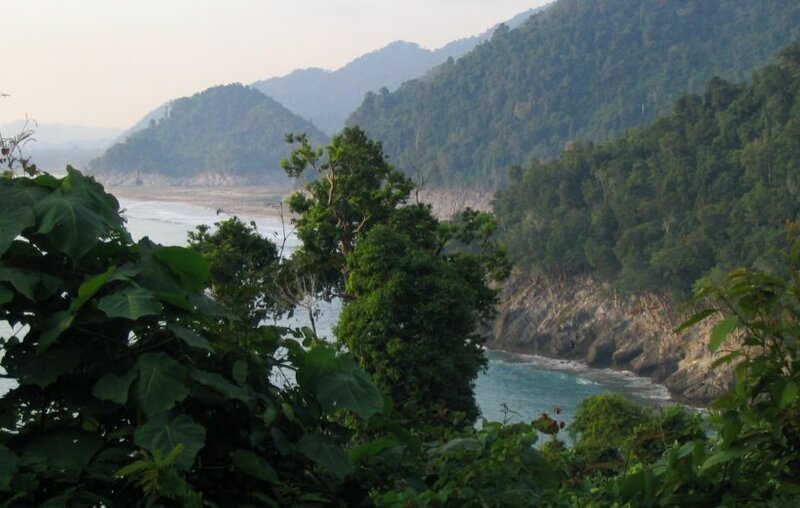 Communication with Aceh, let alone Lamno, is probably very restricted at best so news will be relayed via satellite phone (a gismo provided for his work in the the forests of Borneo and Cambodia) to me in the UK and then hopefully on to this site somewhere in the States. On Friday before he left he indicated that he would try to contact me toward the end of next week. I hope to post an update next weekend (19/20-Feb). My Dad: Campbell called on the satellite phone with all its usual echoes, delays and clicks from the boys in Washington listening in for Osama or Abu Musab al-Zarqawi. Unfortunately, I was out on the farm and the recorded message was very poor. I could only make out that they were both fit and well but working long hours. Kinari is still at the hospital, presumably in Lamno and Campbell, besides taking on IMC administrative duties, is working on setting up a medical lab to support the medical staff in the area. Both are finding their work very stimulating and totally absorbing. Conditions there have moved on from the emergency stage to reconstruction and development. Life for the locals is beginning to return to a more normal pattern and people are getting on with rebuilding their shattered lives. The impression I got from the brief and garbled call was that there was much to be done but just not enough hours in the day. My Dad: Three attempts today to have a conversation over the satellite phone failed but technology came to our aid in that a digital connection via a laptop managed to send an email at $10 a minute. This is the first email of two and dates from 17-Feb-05. If all goes well I should get the second tomorrow. Me: Arrived in Banda Aceh yesterday, and am leaving tomorrow morning on the helicopter to Lamno. Banda Aceh is full of contrasts, the most obvious being the extreme devastation of half the city versus the warmth, humor and optimism of the people. Everyone has a family tragedy, but you’d never know it unless you asked directly. Indonesians in general do not wear their grief on their sleeve like some other cultures do. But scratch the surface, and this faraway look of pained resignation emerges. 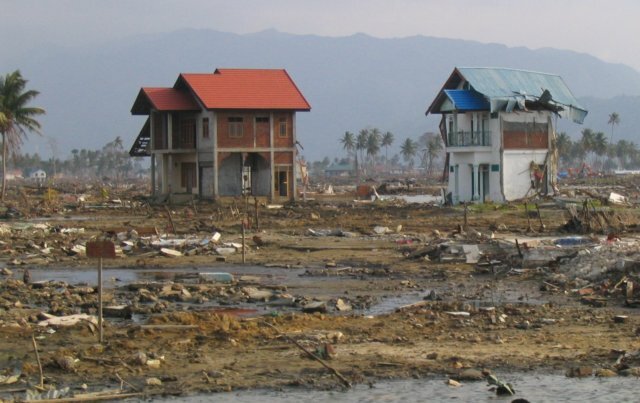 One of the religious and cultural aftershocks of the tsunami is that people blame themselves for what happened. A number of times, I have heard that God sent this as a test and a punishment for the waywardness of people here and the troubles in the Middle East. Sad. Finally you emerge from the town, still more than a mile from the seafront, and you enter a muddy wasteland. Only foundations remain, and a few twisted, rusting cars. And everywhere, huge banks of a fine conglomerate of mud and rubble, wood and re-bar, and the crumpled remains of the thousand sad types of item that we surround ourselves with: bicycles, pots, lampstands, chairs, shoes... And here and there are people picking through the debris, looking for scrap metal and other jetsam. Here and there parts of a house miraculously still stand, and sometimes you see a flag that marks the site of land whose owner survived. But otherwise the land is barren all around for several kilometers, save for the odd tree that was spared the dense development of houses and which now has outlived it. 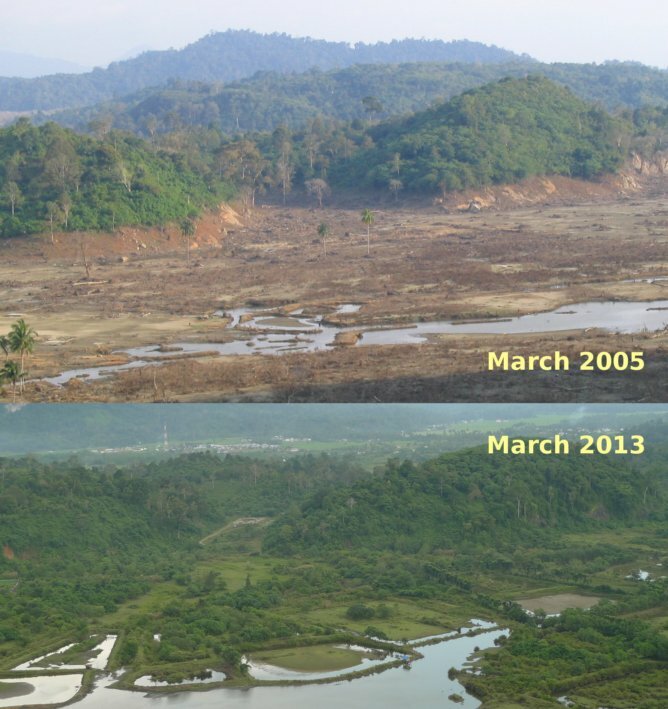 People talk of not rebuilding all the way to the sea again, but of replanting mangrove forest. I found the landscape just too weird to be wrenching; it looks almost like the whole town is in the middle of a being constructed. And people have worked so hard already to tidy up. Pretty much all the bodies have been found and buried, and the roads have been cleared of the sludge of mud and junk. But it is the stories that get you. Everyone I’ve talked to about this has a story of why they were miraculously not near the coast at the time, or how they survived miraculously. I met one man standing forlorn by the remains of his house at the end of peninsular that has become a macabre sightseeing destination for a constant flow of both Indonesians and aid workers. He said he was carried four kilometers inland, clinging to a piece of wood. I went to the university today, to meet the folks in the biology department, and heard the miraculous tale of how the entire department, faculty and students, were coming back by boat from a field-trip to a nearby island. They didn’t even notice the wave. But they all had lost family when they got back to the mainland. Only one of about 25 staff died in the tsunami. In general, about ten percent of both staff and students were lost. The university reopens classes on 1 March. I asked about the general outlook of the students, and they replied that people just want to get on with their lives, and try to return some sense of normality. IMC has been fantastic - helpful and friendly. They all work incredibly hard, and are placing a very heavy emphasis on capacity building, working always with local doctors. I look forward to helping them in return. Translation skills are really needed. Their mission is much larger than just medical work, and I’m sure I can be useful with some of the other programs they are trying to get started in Lamno. With $500 of your donations, I bought a small library’s worth of books (ca. 1000 books, or 100 kg) for the school in Lamno. My Dad: Below is an extract from a short email to the family. Me: All well here - I’m heading out on Tuesday. Can’t believe it’s been a couple weeks already. Sorry not to have communicated more - we’ve both been running non-stop for the whole time. Kinari has generally been doing a clinic in the morning, visiting the hospital in the afternoon and having meetings in the evening. I’ve been translating, receiving supplies, and setting up a portable medical lab. The situation was pretty stable before I arrived, and this is moving into the long-term development phase. The crisis really hasn’t been a medical one. People either died, or generally survived unharmed (physically). The real need is for ways to make a living again. Lamno is beautifully situated, at the foot of steep limestone hills. It has been dry, but started raining again a few days ago, and has cooled off a little. I’ve just left Aceh. Kinari is still in Lamno, and we will meet up in Jakarta next Monday. The experience of Aceh was very powerful, and it’ll take us a while to process, but here are a few preliminary observations. Some many more men survived than women, and the men are taking this hardest. Their job in this society was to protect and provide and they failed and are failing at both. I met many very depressed men who had lost their whole family. They would come join one at a coffeehouse table or on the street and just start to poor out their woes, telling of being washed in, tumbling in the debris-loaded waves, or washed out to sea and rescued by fishing boats. Or their families in their houses by the beach were all lost while they were up in Lamno in the market. A very sad case (though one I didn’t hear personally) was the school teacher at a pesantren (an Islamic school - actually a very famous one, known all the way to the Middle East) who outran his pupils to a hill as the waves came in, and is now totally non-functional, wracked with ‘survivor’s guilt.’ A local beloved superstar is a technician posted at the local television antenna who saw the waves coming from his hill, and shouted out, and thus saved many lives. People talk of three waves. The first was black, probably from sediment scraped off the near inshore, was only 2-3 meters high and surged rather than peaked. The second wave was the most devastating. Riding on the first, it was a peaking, breaking wave of up to 15 meters. The third finished off what the first two didn’t destroy. And then the awesome back-current as much of the water found it’s way off the land. And these waves were not clean, Hawaii-blue waves, but churning full of bricks, motorbikes, planks, tree-trunks, etc. Most people caught by the waves were probably killed by this debris. The crumpled remains of cars is testimony to the waves’ power. I rode a boat back up the rocky coast to Banda Aceh on Wednesday, and for 5 hours I saw this awesome ‘tide- mark’ fifteen meters high. It looked as if someone had taken a scrubbing brush and cleaned all dirt and vegetation from the rocks. Where there was limestone, the rock was a sparkling white band. But... people are rebuilding. People are smiling when they can. They say the most important thing is to keep busy. Whole villages are moving back from the camps to the land that was their village. And so strong are the family networks out here that they say there is seldom a case of land- grabbing of a plot whose family has died - there is always some family member living, even though n-times removed, who can claim the land. And their warmth to strangers is overwhelming. Our presence there (in Lamno) was unequivocally welcomed, and they asked us all not to leave. The tsunami and the presence of outsiders has caused a temporary reprieve in the conflict that was raging around Lamno even the night before the Tsunami, and for this the people are very grateful. So, for my own part, I think just being there was probably the most important thing I contributed. The work of IMC was important, and hundreds (thousands?) of people have had access to healthcare where they would not have had otherwise. But we will probably be gone soon, and the physical contributions we (and you) made are relatively very small. I actually felt more impotent to help when I was out there than I did when I was in the US. I wanted to just take all this money the NGOs are spending on their own maintenance and spread it around the people, but that just can’t be done. The presence of the NGOs is helping, and that is enough. I need to not think in terms of good done per dollar, but think about good done, period. But I kept on feel the need to apologize to the people for not being able to do more. Just back to the US. I’ll post a wrap-up message soon, when I have some photos together, and time to write a short summary. Kinari is well, and has been back from a few weeks. She also wants to add some text. If you want to give us a call we’re here in Martinez. Kinari: We have been back for a few weeks now and are starting to recover. Being a witness to that much suffering was one of the more difficult things I have ever done. Aceh was so complex. There were so many superimposed waves of turmoil, to borrow a metaphor. First there was the Tsunami. At last count 290,000 people are dead but in Aceh everyone knows the number will continue to climb. The scope of the disaster is simply unexplainable and unphotographable. It is too large to get a handle on even when you are standing in the middle of a vast landscape of complete devastation where the houses were wiped to the floor in a few moments and anything that might once have been living lies tangled and rotting in mud and debris. Sorry to use such harsh words, but such was the experience. A harshness one hopes never to meet in ones lifetime. On the coast, 90% of the people were killed. That means that for the 10% left, they have lost everything and often everyone. One model of suffering says that first there is a mute phase that is followed by a hyperexpressive phase where people try to “re-story” their experience. During our time there most people seemed to be in this hyperexpressive phase. Cam and I were sought out day and night. People were desperate to tell their story with someone who had not themselves suffered and who spoke Indonesian. I believe this was for them a way of verifying the reality of the horror they had been through. This may have been one of the most important things we did; to listen, to cry, and to say simple but powerful things. “This is not your fault” needed to be heard. How does one recover from the experience of having your children ripped from your arms by the wave, of out-running your family, or of loosing everything you have spent a lifetime building. People not only lost their families and possessions, they lost their identities and their trust in the universe. A 9.0 earthquake followed after 15 minutes by 3 waves. The second was ~60 feet tall by multiple accounts and verified by marks on the few remaining trees. Taller than the coconut palms they all said. Most educated people have some concept of a Tsunami but these people had never heard of the concept. When the water rushed out almost everyone stood and stared. What does this mean? How is this possible? Am I dreaming? What would we do if the sky suddenly turned red? Would we run? Where would we run to? I would probably just stand and stare too, wondering. The final component of the intense complexity of this place was the NGO community (non-governmental organizations). There is a wealth of literature about how NGOs can do more harm than good but as far as I could tell, none of the people in charge out there had read any of these books. Banda Aceh alone had over 400 NGOs. Overall people were very grateful that the world community helped so much and there was not a day that went by that people did not thank me for coming and ask me not to leave. It is likely true that hundred of thousands more would have died of starvation if the world community had not come in. However, the waste of money, lack of accountability, and disrespect of Indonesian culture were extremely difficult to bear. Most NGOs seemed more interested in jostling for position and promoting their own agenda than in actually helping people. The most sickening part was the way the aid community lived the “high life”. They rented fabulously wealthy houses, drove expensive land cruisers and allocated themselves multiple luxuries. All of this comes at the expense of the donors and creates a culture of valuing the needs of the foreigners above the locals. Most of the volunteers were good people but the systems within which we worked actively thwarted our ability to do good work. If it had not been for one NGO, I would have given up on the entire NGO community. This group was called Millennium. They had a completely different method of working than any other group. They started with assessing the specific community needs and then worked on addressing those needs. This is in contrast to looking first at what the donors want and then forcing that on the community. One example is a woman who used to hire 7 people to make a beautiful wedding cloth. She had, however, lost all her sewing machines and supplies. By helping her re-establish her business they helped establish a livelihood for another 7 people as well. This group verified for me that with cultural sensitivity, frugality, and respect, development assistance can be a wonderful thing. Providing aid in the right way is a very difficult thing to do right. One wants to avoid corruption, not create jealousy and to target a true need. We worked very hard at it and I believe we were able to accomplish those things. We thank all of your so much for all the money and support you gave to the people of Aceh. On the accounting page we have given a detailed list of where the money went. Our main expenditures were for two things which local community leaders and the children themselves, identified as particular needs. Both of these things were falling through the cracks. The first was clothing for orphans. There were ~600 orphans in a population of 10,000 refugees and most of these children had only the clothes they survived in. For $2.20 an outfit we got adorable clothes locally and brought smiles to many faces. Cam also did a wonderful job getting over 1000 schoolbooks for kindergarten through high school and we were able to distribute these to the schoolteachers and to the high-school library. Overall, I believe we did benefit the people of Aceh if only by our presence and showing them that people throughout the world cared for them and shared in their suffering. We also felt very blessed personally that the trip opened up in other ways the path for us to return and work long-term in Indonesia. For many years I have hoped to return to Indonesia to start a hospital and Family Medicine training program in an area which has no medical care. My dear friend Dr. Irene and I verified our desire to work together on this project when she came from Jakarta to volunteer in Lamno. It also seems possible now that I will get a visa to work in Indonesia. Cam will continue to do research in tropical trees, teach and do conservation. If you are interested in helping with our projects in any way, please keep checking in at this website for updates as our plans unfold.